It is easy to take launches for granted but when you consider the efforts involved to send up a rocket like SpaceX which successfully carried Koreasat-5A into space and then came down landing adroitly on the “Of Course I Still Love You” droneship, stationed in the Atlantic Ocean, it is amazing. 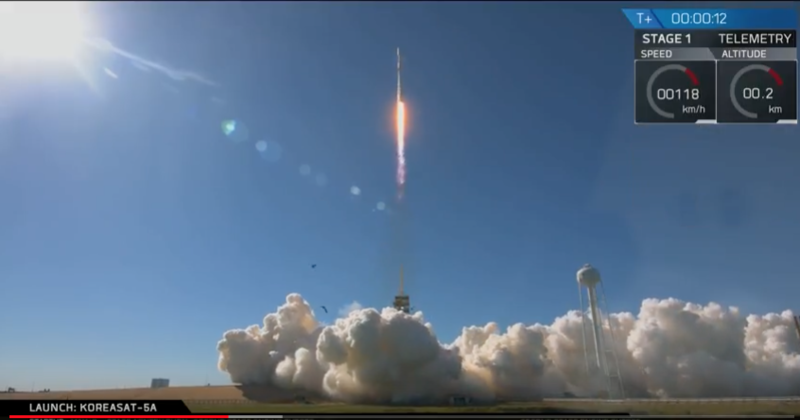 On Monday, October 30th at 3:34 p.m., SpaceX successfully launched the Koreasat-5A satellite from Launch Complex 39A (LC-39A) at NASA’s Kennedy Space Center, Florida. Following stage separation, Falcon 9’s first stage successfully landed on the “Of Course I Still Love You” droneship, stationed in the Atlantic Ocean. Koreasat-5A is a communications satellite operated by KT SAT, South Korea’s sole satellite service provider. The Falcon 9 delivered the Koreasat-5A satellite to its targeted orbit and the satellite was deployed approximately 36 minutes after liftoff. Then SpaceX’s Falcon 9 rocket will deliver Koreasat-5A, a commercial communications satellite, to a Geostationary Transfer Orbit (GTO). Following stage separation, Falcon 9’s first stage will attempt a landing on the “Of Course I Still Love You” droneship, which will be stationed in the Atlantic Ocean. Manufactured by Thales Alenia Space and located at 113 degrees E, Koreasat-5A will provide Direct-to-Home (DTH) broadcast, broadband, and backhaul services with its Ku-Band capacity. Koreasat-5A provides KT SAT with 12 Ku-band transponders of 36MHz, and 24 Ku-band transponders of 54MHz. Koreasat-5A is also equipped with four extended Ku-band steerable transponders (54 MHz each). These steerable transponders will provide commercial DTH broadcasting services in the North Asia region by the end of this year. As a replacement for Koreasat-5, Koreasat-5A will expand KT SAT’s coverage across Asia and the Middle East. Unlike other satellites in the Koreasat fleet, Koreasat-5A will provide maritime coverage of the Persian Gulf, Indian Ocean, South China Sea, and East China Sea. KT SAT aspires to be one of the leading satellite operators in the highly competitive Asian market. The company plans to consolidate its overseas offices into one central hub located in a capital city of Southeast Asia to provide a more relevant presence in its target market. Launch Complex 39A (LC-39A) at Kennedy Space Center has a history dating back to the early 1960s. Originally built to support the Apollo program, LC-39A supported the first Saturn V launch (Apollo 4), and many subsequent Apollo missions, including Apollo 11 in July 1969. Beginning in the late 1970s, LC- 39A was modified to support space shuttle launches, hosting the first and last shuttle missions to orbit in 1981 and 2011, respectively. In 2014, SpaceX signed a 20-year lease with NASA for the use of Launch Complex 39A. Since then, the company has made significant upgrades to modernize the pad’s structures and ground systems, while preserving its important heritage. Extensive modifications to LC-39A have been made to support launches of both the Falcon 9 and Falcon Heavy launch vehicles. These upgrades will also enable the pad to serve as the complex from which SpaceX will launch crew rotation missions to and from the International Space Station for NASA’s Commercial Crew Program. After Koreasat-5A moves into geostationary orbit on November 12th (KST), it will go through transponder and performance testing for one month and provide services in full swing starting next year. Koreasat-5A is a broadcasting and communications satellite that will be placed at 113 degrees east longitude. It was made by Thales Alenia Space, a French satellite manufacturer. SpaceX a United States launch service provider, took the lead in launching the satellite. 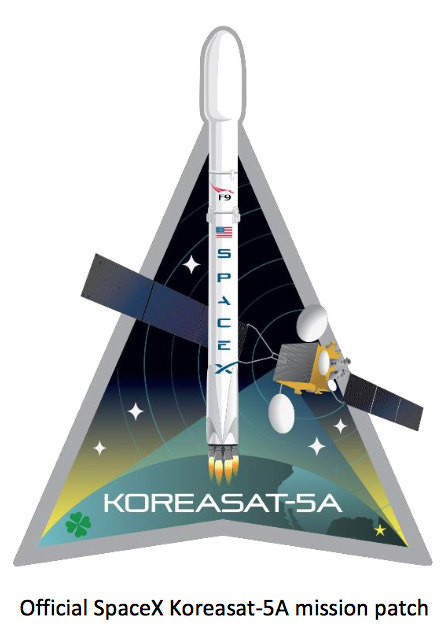 Koreasat-5A is the first Korean satellite launched by SpaceX. Koreasat-5A is equipped with global coverage that can provide services to the Philippines, Indochina, and the Middle East in addition to the Korean Peninsula. Furthermore, the satellite is equipped with a Ku-band steerable beam (refer to the definition of terms), to provide customized services to customers’ desired areas, in addition to the above-mentioned areas. Koreasat-5A is installed with a high-powered global maritime satellite communication-dedicated beam that can connect the East Sea to the South & East China Seas, Bay of Bengal, and the Arabian Sea. The satellite will provide stable maritime satellite communication services to the relevant areas and will contribute to expanding KT SAT’s MVSAT (Maritime Very Small Aperture Terminal) services. Koreasat-5A is KT SAT’s second satellite launched this year, subsequent to Koreasat-7 that was launched successfully in May. As Koreasat-7 can provide services to the Philippines, Indonesia, Indochina, and India, KT SAT will be able to advance into the global satellite market based on its expanded global coverage resources along with Koreasat-5A. The company is receiving great responses from the global satellite market as well. In 2016, KT SAT signed a Koreasat-5A transponder lease contract with DDISH TV, which is Mongolia’s top ranking satellite TV operator. With a large-scale contract on the use of 4 satellite transponder units for 17 years, Koreasat-5A will provide satellite broadcast services throughout Mongolia. In addition, KT SAT has advanced into the Japanese maritime communication market in August. Through the maritime communication-dedicated beam of Koreasat-5A, it aims to continuously expand the global maritime communication market. Telcos and governments of several countries including Thailand and Pakistan are showing interest in Koreasat-5A. KT SAT will strengthen its global coverage through 2 new satellite units that were launched this year. KT SAT declared that it aims to become a top 7 global satellite operator by 2020.